While walking the paths at Mt. Cuba I came across a little ant skirmish. This is odd because I rarely see ants there at all. I've been tempted a few times to ask if I could setup bait stations to see what would come out, and I'm sure the leaf litter there might yield interesting results. The Formica I believe is Formica subsericea. This is a semi-common lawn and road side ant that make some pretty sizable colonies. 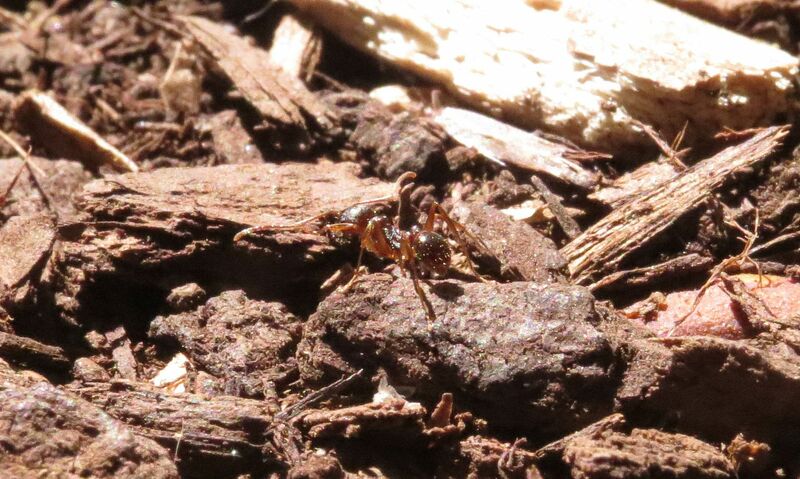 They're reasonably large (about 8mm - 1cm long) fast moving. They're a generalist scavenger you sometimes find tending aphids or nectar scraping the leaves below. Prenolepis imparis, Winter Ants, get their name from their extreme tolerance to cold temperatures. They're out foraging later in the winter and earlier in the spring than any other ant genus in North America. They also hold nuptial flights on the first few warm days of the year as early as February! But more commonly in March and April. They usually nest in woods or along forest edges where they can be close to trees. Their foraging lines are usually bustling with activity venturing well up the tallest trees to feed on sap from new growth, extra-floral nectar pours and aphids. Workers balloon up like the Honeypot ants we have out west but remain mobile and often contain fat bodies instead of nectar (which doesn't taste good). 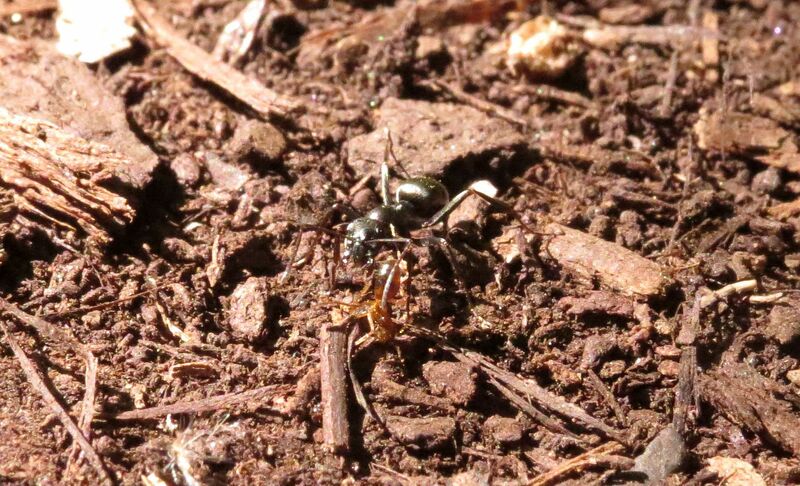 The Winter Ant foraging line was getting bombarded by the Formica workers who swiftly bit their prey into submission. Occasionally the Winter Ants would present their acidopore and spray formic acid in the Formica's face. Ants spraying acid rarely looks as cool as it sounds because the dose they're spraying is just enough to blind or kill the other ant and not itself. They more or less sprites each other with mace. 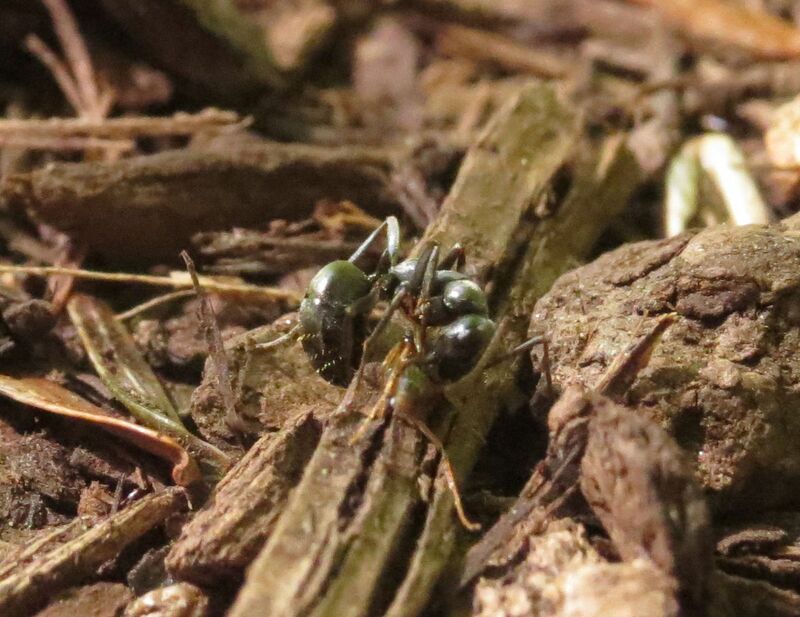 The Formica can spray acid too, in fact that's what their genus is named for, but biting them seemed more effective. Other Formica species that produce large thatch mounds are better examples of spraying acid, because their colonies have to deal with Bears and other large mammals attacking the nest. 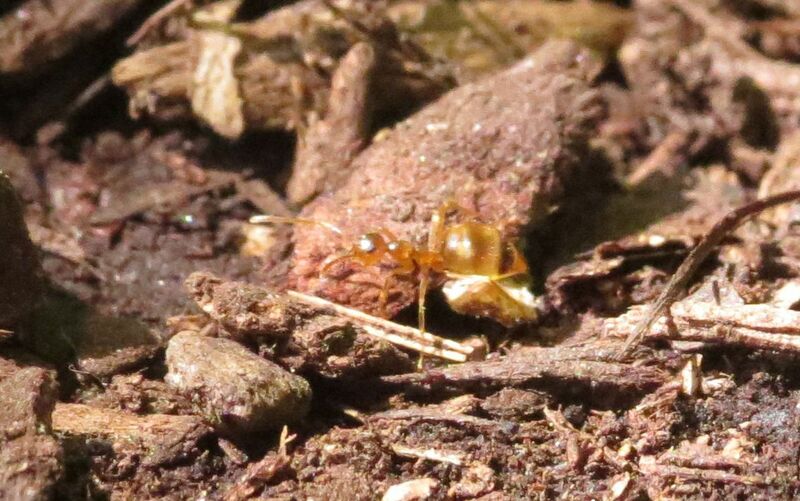 And of course what would a woodland garden be without Aphaenogaster. This genus is likely what's planting the wildflower seeds the gardeners there miss.